Ah, the tween and teenage years: a time of rebellion, testing limits, and feeling frustrated with parents. It’s a little like toddlerhood, but with hormones and perhaps more concern for one’s personal appearance. It’s this last element that a new study from UC Berkeley, La Clinica de Salud de Valle de Salinas, and a local youth council dedicated to involving young people in public health is focusing on. Researchers looked at the effect of personal care products such as make-up, soap, sunscreens, hair products, and perfumes on teens’ toxins levels, as measured by the amount of certain chemicals in their urine. 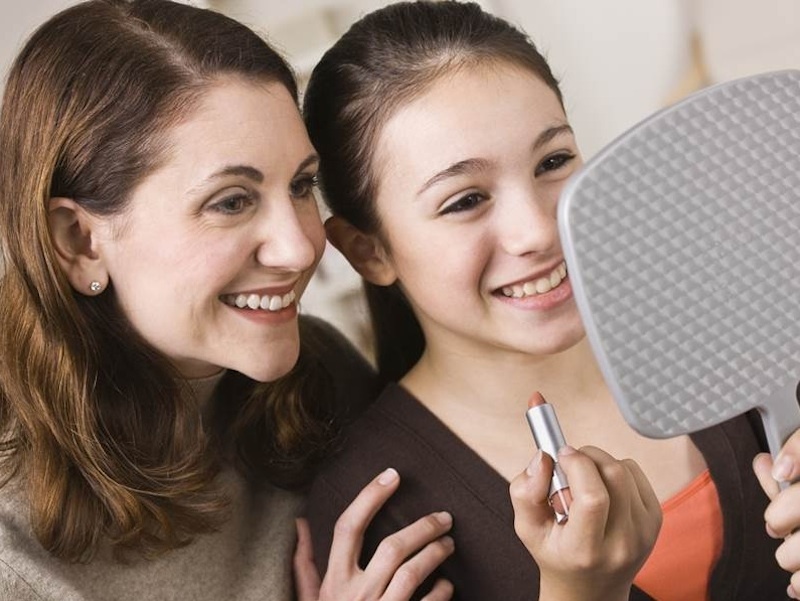 What the HERMOSA (Health and Environmental Research on Makeup of Salinas Adolescents) research team discovered when the study participants switched from toxin-filled to toxin-free products might not be shocking, but their findings are encouraging for anyone contemplating making over their makeup selection to greener, more eco-friendly products. Researchers took urine samples from 100 Latina girls, then provided the study participants with personal care products that were free of parabens, phthalates, triclosan, oxybenzone, and other controversial chemicals (most of which have been banned in other countries but manage to be ubiquitous in the U.S.A.). After three days, the researchers measured urine samples again and found dramatic results. Triclosan and benzophenone-3 (a sunscreen ingredient) levels dropped 36%, diethyl phthalate levels dropped 27%, and methyl and propyl paraben levels dropped a whopping 44 and 45%. The good news is that even if young adults have been using products with common endocrine-disruptors in them, their bodies can make dramatic recoveries and potentially reverse damage caused by said products over a short period of time. The bad news is that these chemicals are so prevalent in personal care products, and most teen consumers don’t know of their dangers. The study’s lead author said, “Teen girls may be at particular risk since it’s a time of rapid reproductive development, and research has suggested that they use more personal care products per day than the average adult woman.” The research was published in Environmental Health Perspectives, but we’re counting on the local teens who helped plan, design, and carry out the study to spread the word on the value of choosing personal care products with safer, cleaner, less toxic ingredients. These young researchers have already begun to educate their community and even presented their findings to lawmakers in Sacramento. Ah, the tween and teenage years: a time of rebellion, testing limits, and feeling frustrated with parents. It's a little like toddlerhood, but with hormones and perhaps more concern for one's personal appearance. It's this last element that a new study from UC Berkeley, La Clinica de Salud de Valle de Salinas, and a local youth council dedicated to involving young people in public health�is focusing on. Researchers looked at the effect of�personal care products such as make-up, soap, sunscreens, hair products, and perfumes on teens' toxins levels, as measured by the amount of certain chemicals in their urine. What the HERMOSA (Health and Environmental Research on Makeup of Salinas Adolescents) research team discovered when the study participants switched from toxin-filled to toxin-free products might not be shocking, but their findings are encouraging for anyone contemplating making over their makeup selection to greener, more eco-friendly products.